We’re sharing our refined infographic for the Brand Spectrum(SM), our comprehensive look at how all the elements of your business and brand strategy (as well as all of your creative products) relate to each other and work together for maximum impact. 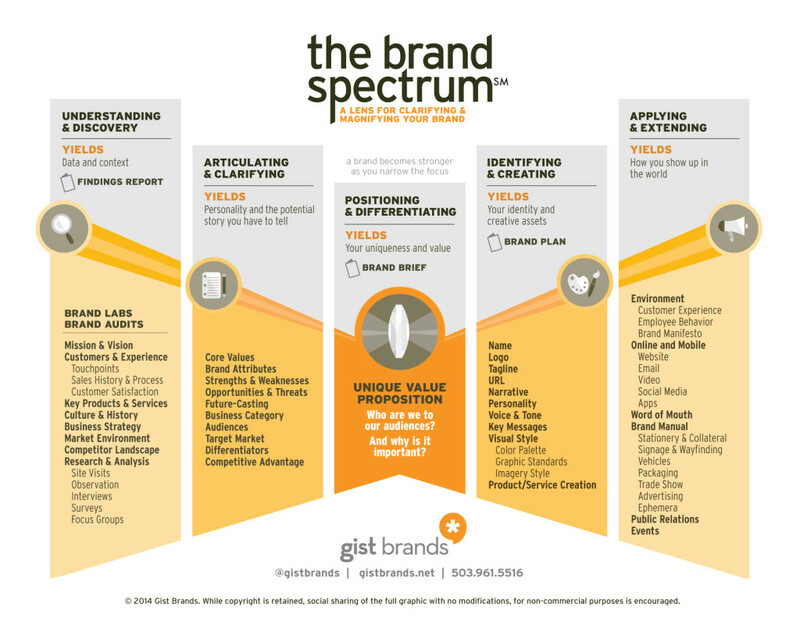 A holistic branding or rebranding process steps through these five stages to discover, articulate, differentiate, create, and activate your brand. Most people know many of the individual items in these granular lists and recognize they are important, but are understandably lost about how they interrelate, or in what order they should be tackled. This 30,000 foot view gives you a contextual map for establishing or refining your brand. Would you like to embed or share this info graphic? Use the embed.ly card below.